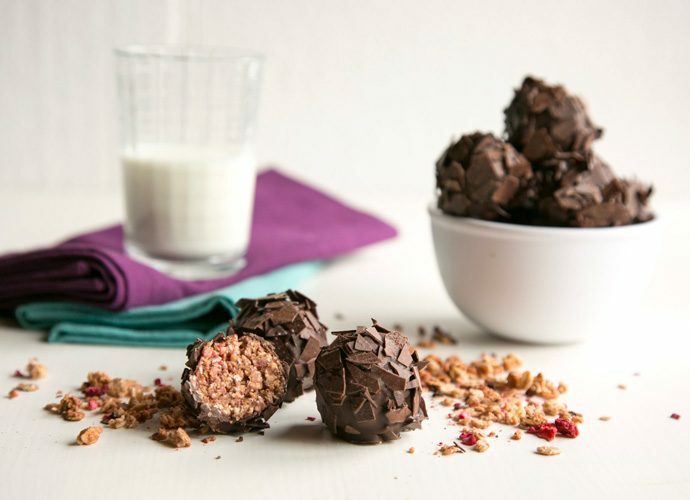 These 3-Ingredient Granola & Chocolate Energy Balls are perfect for busy mornings – Get all the taste of a breakfast cereal bowl packed in a gluten-free, decadent but oh-so-good-for-you energy ball. Last year, I start noticing more and more energy balls pictures popping up on my Instagram feed– I was excitingly surprised they had become such a popular food. Super easy to make, energy balls are one of my favorite snacks to prepare ahead of busy days, especially when it looks like I’m going to be out and about in the city for the whole day. And even though I make them regularly, I just realized there was not a single recipe here on the blog showcasing this awesome snack. Boooo for me! But here I am making amend, and sharing with you the most easy, decadent and irresistible Granola & Chocolate Energy Balls. These little balls are perfect for a quick breakfast on the go or even for an afternoon pick me up, providing a nice energy boost to keep you going until lunch/dinner. It takes just 15 minutes, start to finish, to prepare a batch of these ridiculously delicious gluten-free Granola & Chocolate Energy Balls. My favorite part? You only need 3 simple ingredients: milk, granola and dark chocolate. I love using my homemade granola, this time I swapped the chocolate used in the recipe with extra dried berries, but you can totally go for the original recipe. In order to make it gluten-free, remember to use certified gluten-free oats to ensure a celiac can eat them safely. Otherwise, whenever I don’t have much time on hand, I use a good-quality organic store-bought granola. For the milk, I opted for a2milk. If you follow me regularly, you know that I’ve been using this milk for ages, whether I’m adding it into my recipes or I’m just enjoying a cup of latte. If you have a hard time digesting regular cow milk, I cannot recommend a2milk enough, it’s super gentle on your tummy and doesn’t cause any bloating or discomfort. Truly an amazing product. 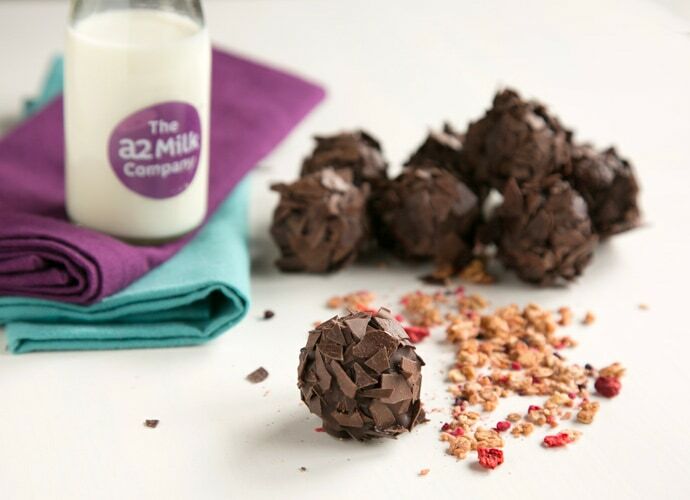 Back these chocolate energy balls, they couldn’t be easier to make. All you have to do is throw granola+milk into your food processor and whizz until combined. Then form your tiny delicious balls, and freeze for a couple of mins. Drop each ball into melted chocolate, then roll them into extra chocolate flakes. There you go, a fun, easy-peasy snack that takes no effort and looks just as fancy as chocolate truffles! 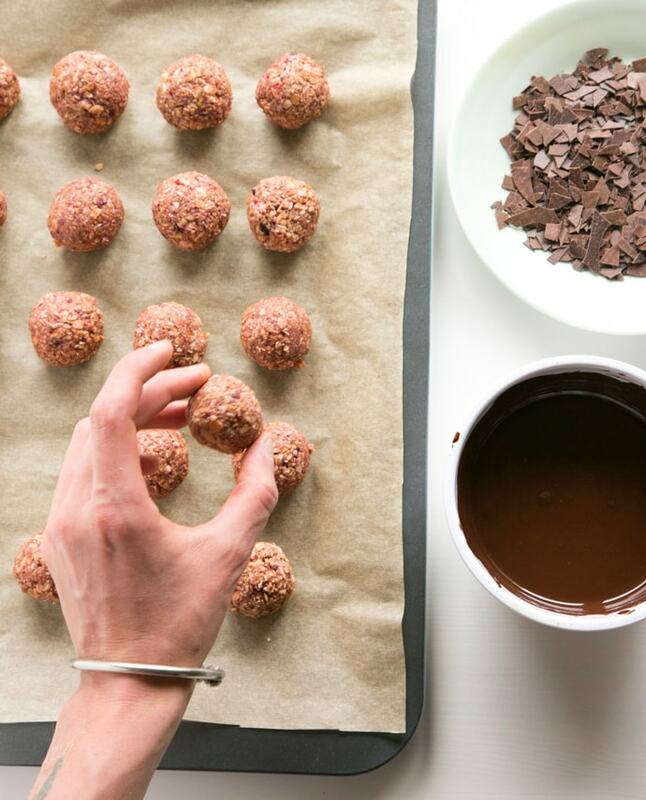 These Granola & Chocolate Energy Balls are also super easy to customize. Don’t have granola at hand? Opt for muesli or your favorite cereals. Fancy milk chocolate instead of dark one? Make the swap. Want to add extra dried fruits or nuts? Go for it! 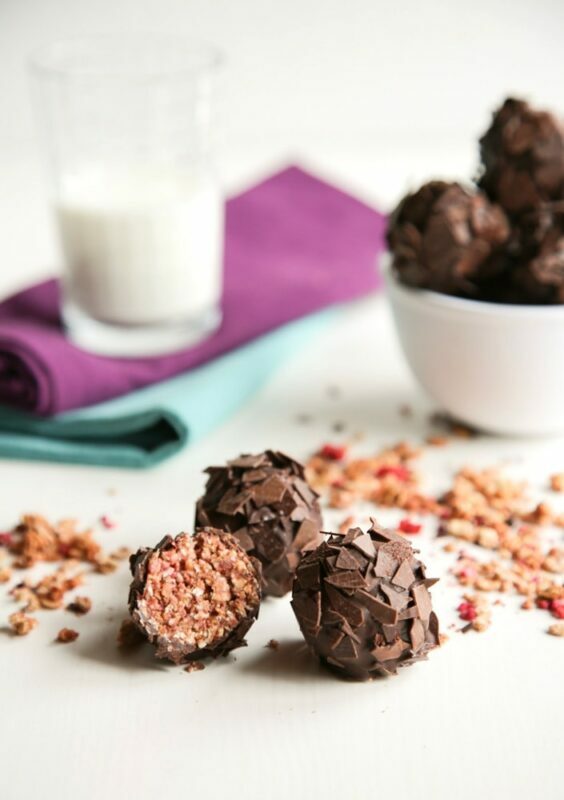 These gluten-free Granola & Chocolate Energy Balls are perfect for busy days – Get all the taste of a breakfast cereal bowl packed in a tiny decadent dessert-looking energy ball. These 3-Ingredient Granola & Chocolate Energy Balls are perfect for busy mornings - Get all the taste of a breakfast cereal bowl packed in a decadent, gluten-free no-bake energy ball! Place granola in a food processor and pulse until finely crumbled. Pour in the milk and continue to pulse until reaching a compact mixture, about 1 min, scraping down with a spatula every now and then if necessary. Shape the mixture into tiny balls with the help of your hands, and arrange on a baking tray covered with parchment paper. Place in the freezer for 5 min. In the meantime, place chopped chocolate into a microwavable bowl and microwave for 30 seconds. Stir the chocolate with a spoon until melted through, and allow to cool for a couple of minutes. Dip each energy ball into melted chocolate, then roll into chocolate shavings. Place in the freezer for an extra 2 minutes to set the chocolate and serve. If the energy balls mixture is too soft add extra granola, if it's too dry just add a bit of extra milk or 1 tbsp of coconut oil. Those chocolate shavings make your energy balls look so nifty! They look gorgeous! I love the sound of these energy balls! That milk is great – we’re trying my daughter on it at the moment. 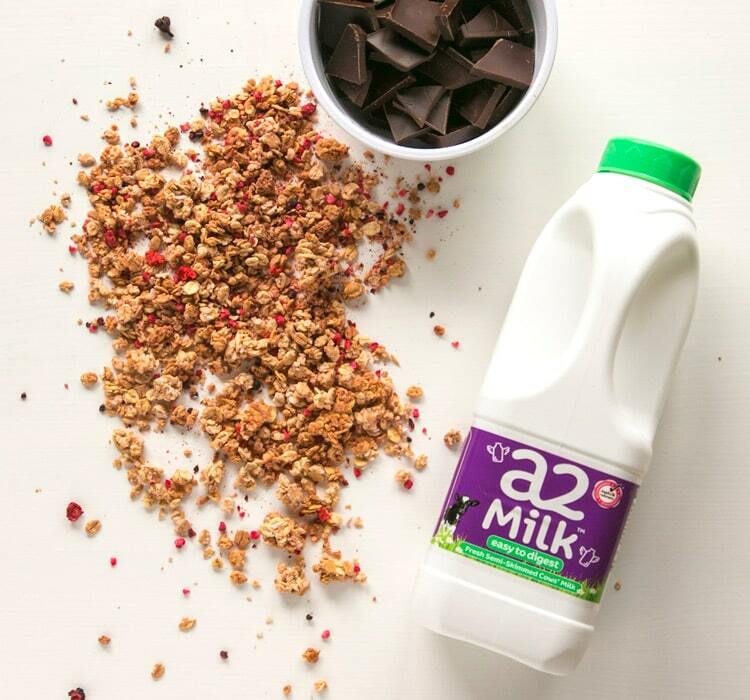 A2milk literally changed my foodie life! No more bloating or stomachache, I love it! 3 ingredients and only 15 minutes? Sign me up, please! I love these kinds of recipes for breakfast or snacks. Give it a try Sarah, I promise it tastes so much better (and it’s good for your body) than most commercial milks! These sound amazing and only three ingredients make them irresistible! These energy balls sound incredible! I love the chocolate shavings on the outside. So pretty.